"How do too many values compete in Forests?" As a member of a technical advisory committee to the local Superintendent of the regional National Forest. The citizens committee established by the U.S. Forest Service (NFS) to encourage participation in the decision making process of forestry policy has demanded that the Forest Service open more acreage to logging in order that the local mills have sufficient timber to operate throughout the Christmas season and into the new year. The last superintendent was transferred for saying that at current logging rates the equivalent of 129 football fields / day disappear. What will you do and how will you advise this superintend ant to respond to these following issues? The Unites States Forest Service [USFS] is a federal land holding agency in the Department of Agriculture with the duty under the Multiple Use Act of 1960 to provide a variety of people access to the resources of the forest lands including, hunters, fisherman, hikers, & lumber companies. Merrill K. Ridd, geographer and Forest Service employee, wrote, in 1965, that "The object of multiple use management is very simple. It is to manage the resource complex for the most beneficial combination of both the present and future uses." Under the 1960 Legislation Congress enacting Public Law 86-517 states in part: "The Secretary of Agriculture is authorized and directed to develop and administer the renewable surface resources of the national forests for multiple use and sustained yield of several products and services obtained therefrom." As Ridd points out "While the doctrine of multiple use is widely accepted, there is still some misunderstanding of how it should be accomplished." And this is why the new superintendent has appointed you as a technical adviser to inform the Forest Service on the best course of action. 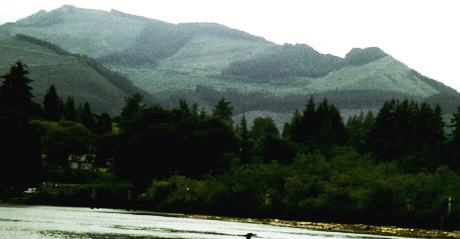 Selectively clear-cut forest patches on the Columbia River. The forested area in question is 85% conifer and mixed deciduous hardwood stands covering steep slopes and some inaccessible back country canyons and mountain meadows. 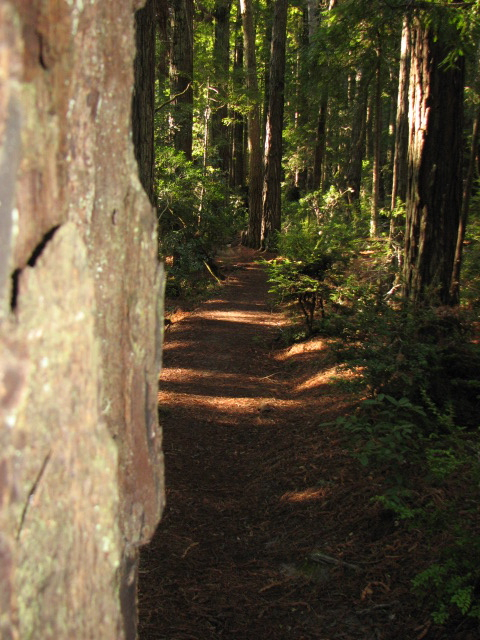 The area covered in aging trees includes Douglas Fir, Red Fir, Yew, Oregon Ash, Big Leaf Maple, Red Cedar, Sycamore, Sitka Spruce, Engleman Spruce, and other hardwoods. A large portion of the lands bordering the National Forest have been logged and replanted in immature lodgepole or ponderosa pine and Douglas fir. This has created a long and sinuous ecotone within the National Forest of mixed soft & hardwood conifers. The request of the citizen's advisory group would log the ecotone, an accessible swath of trees between two clusters of 500 - 1000 year old Spruce, Cedar, Yew or Fir trees, and clear an entire bank of the longest tributary stream in the National Forest. Several economic, ecological, and political facts are relevant to your decision. Throughout the Pacific Northwest lumber operations employ over 109,000 people in logging, milling, and transport. The average wage of a mill worker or logger is $35,000 per year. The unemployment rate in the entire region is above the national average at about 9% and in your local area it is closer to 13%. It is estimated that 1 out of every 4 teenagers just out of high-school is looking for minimum-wage work. Many products are derived from these forested lands. In addition to timber for construction and pulp for paper, wire grasses growing in the forests are used by Vietnamese & Cambodian refugees to weave baskets which they sell in flea markets. Ferns grow in dark forests and both mature ferns are sold to florists for decorative purposes or young fiddleneck ferns are bought by restaurants as a salad delicacy. Recently collectors have asked the Forest Service to grant permits to gather truffles -- a root-fungus -- that has become a lucrative trade item as gourmet ingredients in fine food. 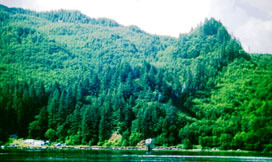 The sustained yield of these forests is also connected to the survival of salmon fishery stocks in the region. The salmon fishery is a $1 billion sport and commercial enterprise employing 62,000 people in the Washington and Oregon region. Finally, four years ago, the Forest Service had to post armed guards to stop people from stripping the bark from Yew trees, taxus brevifolia, since the bark is a source of a cancer fighting agent now commonly synthesized in the laboratory as taxol™. 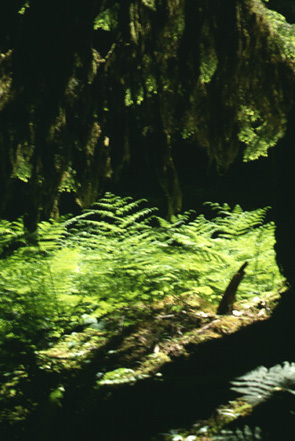 Ecologically speaking the "growth of the conifers in 100 - 1000 year old forests depends on a mutualistic relationship between tree roots and a class of fungi, known as mycorrhizae, that infect their roots. Unable to carry out photosynthesis, these fungi attach themselves to the roots to obtain the sugars they need. The mycorrhizae absorb water, soil nutrients and oxygen, passing these on to the trees. Antibiotic compounds in the fungi protect the tree from root pathogens and act as a protective sheath around the roots to bar parasites. The fungi produce chemicals that speed up the growth of new root hairs and tips. These two mutualistic partners, the trees and their fungi are, in turn, dependent upon symbiotic relationships with a number of small forest rodents such as squirrels, voles, and mice. These creatures feed on the fleshy collection of fungal spores -- called truffles. Once consumed the spores remain undigested, passing back into the soil to grow another generation of root fungus." Without the decaying logs & snags about 1/3 of the mammals would die. The endangered spotted owl feeds on these rodents and nests in old trees. For print friendly version press here. For a larger map press the map above. What is the conflict over the forest? 1. How many groups of people use this forest? 2. How did this conflict over the uses of the forest occur? 3. What did you feel were the salient (key or items of over-riding importance) facts in the forest problem? 4. What was your opinion in reading page 1, or the first half? 5. What was your opinion in reading page 2, or the last half? 6. What is your recommendation to the superintendent of the National Forest?